This picturesque little park is located on the West side of town and measures approximately two acres. It is on a quiet street and feels very secluded though it is only two blocks from Harriot Avenue, the main street that runs through town. It is very shady which makes it cool even in warm weather. It boasts some unique features that make it one of a kind in town. 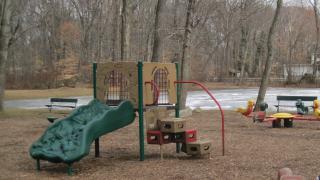 It has a lovely little playground suitable for toddlers and children up to about five years old. The equipment is on a scale that is manageable for very small children. The park also sports four tennis courts, the only courts in town, and supplies adjacent parking. It also has an area that is flooded by the town each winter to make an outdoor skating rink. Another very quaint feature is a small covered bridge that crosses over a stream and connects the playground area to the tennis courts.